Rustam Makhmudov, the man suspected of killing journalist Anna Politkovskaya, was detained in the Chechen Republic and has arrived in Moscow for questioning. ­The news first came from Murad Musaev, the lawyer who defended other suspects in the high-profile murder case. He said he hopes to prove Makhmudov’s innocence of the crime he has been indicted with. Later Russia’s Investigative Committee confirmed the detention of the suspect, adding that Belgian police helped in finding Makhmudov. The man spent some time hiding in the European country after Russian authorities put him on the wanted list. “Having been informed of the alleged whereabouts of Makhmudov, the chairman of the Investigative Committee has repeatedly traveled personally to Belgium for consultations with the leadership of law enforcement agencies of this country to search for the accused,” the Investigative Committee spokesman Vladimir Markin said. “After these meetings, the Belgian police stepped up action to search for Makhmudov, and he was forced to leave the territory of this country," he added. Despite the news, the investigation into Politkovskaya’s death is far from being over, commented Anna Stavitskaya, the lawyer who represents the interests of the journalist’s family. “We have stated many times that the crime will be solved when those who paid for the killing to be done are found and punished,” she told to the RAPSI legal news agency. Politkovskaya’s brother Ilya says the capture of the suspected killer is unlikely to put the investigation closer to that goal. “I believe Makhmudov is the lowest level of the criminals involved. As far as I can judge from the documents I saw during the trial, he’s not someone who may know the contractor,” he told Interfax news agency. Fred Weir from the Christian Science Monitor believes there is some fresh sign of political will, which explains why Makhmudov has been arrested now. “What everybody wants to see are the people who ordered that, the mastermind to be named and hopefully brought to justice,” he told RT. Weir also suggested the journalist’s investigative activities as one of the reasons of the murder. “She was the only Russian journalist during the second Chechen war who reported on what was going on from every corner, reported the voices of average Chechens, Chechen women – even rebels. She was the only one doing this and, because of that reporting, she obviously made some dangerous enemies,” he said. 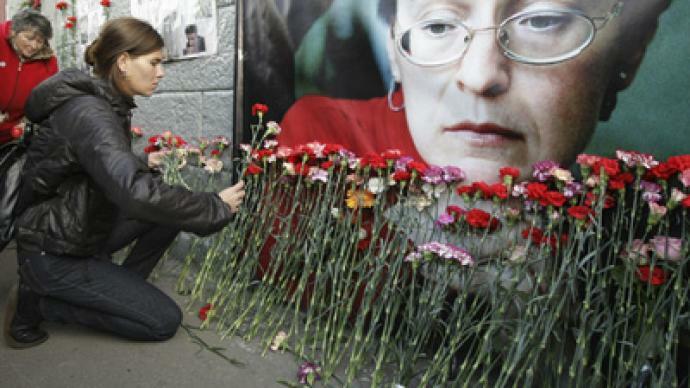 Politkovskaya, who investigated human rights violations in Chechnya, was killed at the door of her apartment n Moscow on October 7, 2006. Several people have been charged with conspiring to kill the journalist. In January 2009, the main suspects were acquitted, though Russia’s Supreme Court then revoked the ruling. Makhmudov, who is believed to be the man to have fired the fatal shot, has never stood trial for the murder and has been on the run for several years. There have been similar murders, like those of human rights activist Stanislav Margelov and journalist Anastasia Baburova, and both saw successful prosecutions. Journalist Nina Ognyanova believes the arrest of Rustam Makhmudov is another positive sign for cases like this. ”This is definitely a landmark victory in the fight against impunity in Russian journalists’ murders and not just journalists, but also human rights defenders and lawyers. We see this as a significant step forward,” Ognyanova said. “We’ll continue to call on the investigative committee and other prosecuting authorities in Russia to complete the investigation and have all the perpetrators in the dock,” she added.